Exxon Mobil (XOM) is one of the world’s oldest oil companies, founded in 1870. It’s also the world’s largest publicly traded integrated oil conglomerate, with nearly 30,000 oil & gas wells on six continents. In fact, thanks to its refining and petrochemical business, Exxon has a presence in almost every country on earth. The company operates in three distinct but interconnected business segments: upstream oil & gas production, downstream refining, and specialty chemicals. The logic behind such an integrated business, in which Exxon controls all aspects of the fossil fuel business (from production to refining and retail gasoline sales), is that it diversifies Exxon’s sales, earnings, and cash flow. For example, low oil prices resulted in almost no profits from upstream oil & gas production in recent years. However, these low commodity prices resulted in cheaper input costs that allowed the midstream refining and chemical divisions to report stronger earnings and help Exxon still generate billions of dollars in profit. Thanks to its integrated business model and conservative management, Exxon and its predecessors have paid uninterrupted dividends since 1882. The energy giant has delivered 36 consecutive years of annual dividend growth as well, making it just one of three dividend aristocrats in the energy sector. Exxon’s primary competitive advantages are its scale, diversification, and conservative approach to capital allocation. These factors have helped the firm deliver one of the most impressive dividend track records in corporate America. Starting with scale, Exxon's numbers are eye-popping. The firm's current total liquids production of 3.8 million barrels per day (bpd) exceeds all but seven countries' daily oil production rates, for example. More important for long-term investors is the fact that Exxon’s proven reserves are enormous, meaning that its massive energy production is likely to continue for decades to come. Specifically, the company’s proved oil and natural gas reserves total more than 21 billion oil-equivalent barrels to provide solid visibility. As a result, Exxon has a long reserve life of about 15 years at current production rates, which is among the best in the industry. Exxon’s track record of profitably replacing its resources through drilling and acquisitions is also impressive given the firm's size and focus on earning an industry-leading return on invested capital. Like clockwork, over the long term Exxon has consistently found new reserves faster than it has produced oil. For example, in 2017 the company's proved reserve replacement ratio (new reserves/production) was 189%, and in 2014 and 2013 it was 111% and 103%, respectively. While during periods of low oil prices the company does pull back on exploration spending, over the last 25 years Exxon's reserve replacement ratio has averaged over 100%, ensuring continued strong production of its key product for many years to come. To appreciate the company’s substantial resource base, if Exxon were a sovereign nation, its proven oil reserves of about 12 billion barrels would give it the 17th largest proven oil reserves of any country. Exxon's impressive size is a competitive advantage because the oil business is highly commoditized, meaning that the price a company can get for its products is almost entirely at the mercy of international markets. Due to the highly volatile prices of oil & gas, integrated oil companies are also faced with inevitable boom and bust cycles, in which sales, earnings, and free cash flow can swing wildly from one year to the next. However, oil companies have to continually invest in new production projects since the typical oil project sees about 5% decline rates each year according to research firm Wood Mackenzie. With many large oil projects taking several years to complete and start generating cash flow, companies have to make long-term capital allocation decisions and keep investing in both exploration and new production projects, even during oil crashes. This is when quality management and a strong balance sheet become essential. Exxon's return on average capital employed (a key industry measure of asset efficiency), has consistently been the highest among the five integrated oil majors, underscoring the company's operational discipline. Similarly, the firm's total write-offs for investment projects or acquisitions that didn't work out has been the lowest. Exxon’s high returns are also thanks to its integrated business model, which enables it to react more effectively, efficiently, and quickly to changes in the business environment. Simply put, the company’s diverse asset base provides market optionality and operational flexibility while allowing Exxon to optimize profits throughout various commodity cycles better than most of its peers. The other important factor for oil & gas companies is the balance sheet, which allows them to borrow to cover growth spending (as well as dividends) during industry down cycles when free cash flow can fall significantly or even turn negative. Exxon closed out 2017 with the strongest balance sheet of any oil major, and today its leverage profile remains just as strong with an 11% debt-to-capital ratio and an AA+ credit rating. Not only is that the best credit rating of any company in the oil industry, but it's also one of the strongest ratings in all of corporate America, a testament to the company's disciplined and conservative use of debt over time. Due in part to the firm's financial flexibility, today Exxon's management has a bold vision for the future which includes the most aggressive growth spending in the industry. While many energy producers have pulled back on spending, Exxon's eagerness to invest is partially driven by the U.S. Energy Information Administration's forecast that 80% of new oil supply by 2040 will merely offset natural production declines. Combined with continued economic growth, especially in emerging markets like China and India, oil demand is expected to rise slowly over time, while current investment levels point to a future shortfall in supply. Exxon estimates that the global oil industry would need to spend $8.4 trillion over the next 21 years to meet this demand, or about $400 billion per year. In other words, if these projections are correct, the oil industry needs to invest enough money to drive 3 million bpd production growth just to keep global supplies at current levels. Add to that about 1.5 million bpd in demand growth, and worldwide oil production levels need to rise by about 4.5 million bpd just to keep prices stables. As you can see, Exxon plans to increase its annual spending by almost 60% over oil crash levels (2016). Management believes that this will result in substantial production growth, including increasing its daily oil production from 4 million barrels per day (bpd) to 5 million (a 25% increase). The most important benefit would be the expected strong growth in its operating cash flow, which is expected to soar by between 105% and 150% if oil prices average between $60 and $80 per barrel over that time. If those assumptions approve true, then Exxon’s free cash flow (what normally funds the dividend) might rise to $31.5 billion to $45 billion annually over the next seven years (up from about $13 billion in 2017). And even if oil prices average much lower, $40 per barrel, Exxon expects to still see strong growth in free cash flow that would allow it to maintain its status as a dividend aristocrat. So far Exxon's peers are unwilling to increase their spending, but the company believes that it is ahead of the curve and its big spending hikes will ultimately give it a major advantage over its rivals in the future. Major oil projects have long lead times (up to five years), so by spending big earlier than other companies, Exxon could be poised to profit more from long-term secular trends in the global economy and its core energy markets. Only time will tell. However, as The Wall Street Journal noted last summer, Exxon's reputation as an excellent capital allocator has lost some of its shine over the past decade. The company pursued a number of big upstream projects in costlier, riskier areas (Canada's oil sands, the Russian Arctic, etc.) when the price of oil traded near an all-time high. Returns on many of these investments disappointed following the oil price crash. Exxon also bought gas producer XTO Energy for around $40 billion in 2010. Unfortunately, natural gas prices stayed lower for longer than management anticipated, forcing the company to eventually take an uncharacteristic write-down on its natural gas assets. Worse, despite all of these investments, Exxon's production output of 4 million barrels a day has remained largely the same since its merger with Mobil in 1999. Combined with the impact that renewable energy could have on the long-term returns earned by Exxon's planned fossil fuel investments, and it's easier to understand some of the skepticism surrounding management's ambitious plans. So where exactly is Exxon planning to spend $30 billion per year in order to achieve such stunning production and cash flow growth? One key area of focus is the company's extensive U.S. shale acreage, especially in the Permian basin of West Texas and Eastern New Mexico. In 2017 Exxon spent $6.6 billion to buy some of the Bass family's assets, which doubled its Permian proven reserves to about 6 million barrels. The company has also made smaller bolt-on acquisitions as well, and today management estimates that Exxon owns about 10 billion barrels of U.S. shale reverses that can generate 10% annual rates of return at just $35 per barrel U.S. crude prices. As fracking technology improves, break-even costs are expected to continue falling in the coming years. By 2025 Exxon expects it will have boosted its daily production from that shale formation alone by about 400%. Outside the U.S., Exxon's growth spending is focused on global oil hotspots like Brazilian offshore, where it has the largest net acreage of any oil major. Production costs have fallen low enough that even at $40 per barrel oil Exxon estimates it can generate over 10% annualized returns in parts of this market. But perhaps the most surprising long-term growth driver for Exxon is Guyana, the small South American country that is potentially poised to become a future oil powerhouse. Like the Permian basin, Guyana is surprising the industry with ever-rising offshore reserve estimates; companies are exploring off its coasts and finding every larger pockets of high margin crude deposits. In December 2018 Exxon announced its 10th discovery offshore Guyana since May 2015, raising its estimate of the discovered recoverable resource to more than 5 billion oil-equivalent barrels, according to Stabroek News. Guyana oil production isn't coming online until early 2020 when the company expects daily production to hit up to 120,000 bpd (about 2.5% of today's levels). However, Exxon is playing the long game here and by 2025 believes Guyana could produce more than 750,000 bpd. For context, Exxon's entire production growth plan through 2025 calls for an increase of just 1 million bpd, so Guyana alone has potential to deliver a significant chunk of management's target if the company continues finding new offshore deposits. Overall, Exxon is one of the best run and financially strongest integrated oil majors in the world. The firm's capital discipline, quality assets, integrated operations, diverse resource base, and scale will continue to serve Exxon and its dividend well for many years to come. With management now outlining the most aggressive growth plans in the company's history, income investors could also benefit from not just a generous dividend, but one with potential to grow at a faster pace going forward. However, while Exxon appears to remain one of the more appealing high-yield oil stocks, there are numerous risks to keep in mind before investing. While Exxon’s dividend aristocrat status suggests that it could be a relatively low-risk company to invest in, there are several factors to watch for going forward. For one thing, Exxon still needs long-term energy prices to rise and stabilize in order to comfortably invest in future growth, as well as continue increasing its payout at a healthy clip. But as we saw in late 2018, oil prices can be highly volatile. Between October 2018 and December 2018 the price of oil plunged as much as 45%. That two-month decline was one of the fastest oil crashes in history and shocked even veteran industry analysts, many of whom had been predicting that crude might soon hit $100 per barrel. In addition to short-term commodity price volatility, it's worth mentioning that all long-term energy forecasts are merely educated guesstimates that frequently change over time as new data comes in. For example, Exxon's long-term growth plans are based on forecasts that global oil demand will continue to grow, though at an ever-slowing rate (0.7% per year), through 2040. However, while an expanding world population and relatively fast economic growth in developing nations such as India and China mean that oil & gas demand is likely to rise for the foreseeable future, growing pollution concerns in these nations mean that an increasing amount of investment is finding its way into renewable sources. For example, between 2016 and 2020, China plans to invest $72 billion per year into renewable energy, according to the National Energy Administration. India’s clean energy plan is even more ambitious. Specifically, that country hopes to generate 60% of national electricity capacity from non-fossil fuel sources by 2027. It's hard to say what the global energy landscape will look like in 10 years, much less in 2040. However, should solar, wind, and energy storage technologies continue becoming more affordable, it's possible they disrupt oil and gas demand faster than management expects. 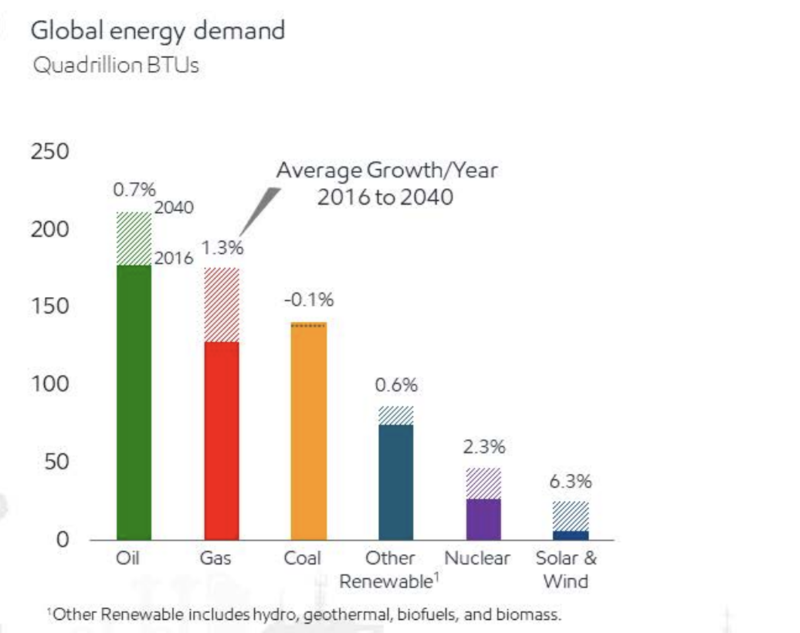 For example, one analyst at UBS thinks that renewable energy might "effectively be free" by as soon as 2030 as solar and wind farms gain critical mass. While that's likely an overly optimistic target, investors need to remember that management's ambitious growth investments are far from guaranteed to generate strong returns on invested capital. Should long-term oil & gas fundamentals move in the wrong direction for any reason, Exxon's stock could find itself in the penalty box as investors increasingly question management's capital allocation abilities. For now, Exxon deserves the benefit of the doubt. Demand for oil may be only growing at about 1% per year, but a 5% decline rate in global oil fields means that the industry will need to step up investment if it is to meet the needs of a growing and richer world over the next decade and beyond. While it’s certainly possible that Exxon’s large investment plans might not work out (cost overruns, project delays, global recession causing another oil crash, a surge in renewable energy adoption), it seems more likely that Exxon will succeed in meaningfully growing its production and free cash flow through 2025 as management expects. Beyond 2025, Exxon will likely have to evolve its business model again, perhaps diverting more cash flow during boom times to acquire renewable assets it may need to prosper in the coming decades. While no oil stock’s dividend is ever completely secure in a volatile energy environment, when it comes to dependable income in the oil sector, you can’t get much better than Exxon Mobil. Exxon is one of the few energy stocks to consider owning in a diversified income portfolio given the structural changes taking place in the global oil market. The company's proven management team, industry-leading balance sheet, low-cost operations, and long-term investment plans mean that the firm is likely to have sufficient financial resources to grow and adapt to an evolving energy landscape in the years to come. While oil prices will always be volatile, proven blue-chip stocks like Exxon remain a reasonable choice for conservative income investors looking for safe and growing dividends.